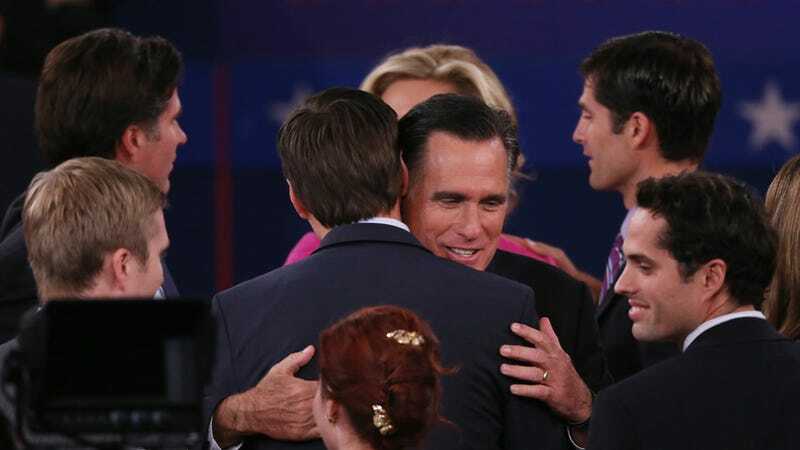 Is Mitt Romney's Outdated View of Family a Threat to Modern Society? During Tuesday night's second presidential debate, while answering a question about assault rifles, Mitt Romney veered off on a family-values tangent. "But gosh, to tell our kids that before they have babies, they ought to think about getting married to someone, that's a great idea," he said. Earlier in the night, Romney boasted about letting female employees off work in time to make dinner for their kids. It was a uniquely honest glimpse, as one New York Times editorial succinctly put it, of a man desperately trying to graft "2012 talking points onto his 1952 sensibility." These moments of transparency exposed a man deeply out of touch with what families are like today, a man still pining for a world in which we all aspire to be the Cleavers. Unfortunately, Romney wasn't the only person launching public attacks on the unmarried this week. In a confounding move, a prominent Rabbi writing for The Jewish Press shamed 42-year-old, unmarried, childless Jewish comedian Sarah Silverman for her inability to "forg[e] a permanent relationship," offering unsolicited advice for why "a happy marriage is the key to wholesomeness" and to pray publicly that Silverman will "pursue marriage and, if you are so blessed, raise children." What made this unsolicited public attack so shocking was that Silverman's main transgression was daring to make life choices that didn't conform to Rabbi's Yaakov Rosenblatt's worldview about what women are supposed to aspire to: marriage and babies. In reality, the country is very different than both these men would like it to be—the structure of our relationships, families, and work lives have all been changing rapidly in recent decades. On the professional front, women have been outpacing men in bachelor's degrees since 1996, and now have more advanced degrees than men, too. They make up the (slight) majority of the workforce, and in 147 out of 150 of the biggest cities in the United States, young women's salaries are higher than those of their male peers. On the home front, according to census data, far fewer folks are marrying than just a few decades ago and those who do marry are marrying later. More women are childless and those who have babies are having them later. A record 4-in-10 births are to unmarried women. All of this terrifies and confuses Romney and men of his ilk. There is something telling about Romney's advice to "get married to someone" that's worth exploring. He didn't say to marry your beloved, your partner, your boyfriend or girlfriend, or your lover, because the who is unimportant. Marriage is a palliative to all social ills: Want to reduce crime? Marry someone! Stuck in poverty? Marry someone! For him, it's the institution of marriage that is king, not the relationship. Suckering someone, anyone, into signing that old marriage license is, in itself, a victory. But he's not alone in his simple-mindedness. There are many who believe that declining marriage rates and rising out-of-wedlock birth rates signal a coming apocalypse, or at the very least, the destruction of the social fabric they believe holds this country together. But all the hand-wringing is futile: You can't just stop demographic trends. They are the result of larger economic, political, and cultural forces that have been at play for some time. Isn't the sensible response to figure out how to support the reality of what individuals' lives look like now rather than try to shove them back to a past that no longer exists? As Stephanie Coontz explained in her fascinating 2006 myth-busting book, Marriage, A History, despite the cultural power the traditional nuclear family has, it's actually only very recently in our history (about 200 years) that people began marrying for love and emotional fulfillment. For the 5,000 years prior, marriage was an institution based on economic necessity and contractual obligation where the idea of marrying for love would have been considered dangerous and absurd. When emotional fulfillment gained primacy within marriage in the late 19th century, a funny thing happened: Marriage became more satisfying as a personal relationship, but more fragile and fraught as an institution. The arc of history is long, and when it comes to the relatively new invention of love-based marriage, we're still just figuring it out. There is simply no single right way to do relationships, marriage, or family anymore. Depending on your perspective, that's either immensely liberating or cause for alarm. The important question for those of us in the reality-based community is how to meet people where they are. Just think about your own extended family: Do they all resemble Romney's ideal of what a family should be? Do your friends? My guess is probably not. There is nothing inherently damaging or intrinsically problematic about family structures that deviate from some nuclear family ideal. Presidents Obama and Clinton were both raised in single-mother households, after all. Romney can pine for some regressive 1950s white-picket-fence vision that was a historical blip on the cultural radar (for some privileged white heterosexual folks), but unless he has a super secret plan to make lifelong heterosexual marriages, babies, and home-cooked meals mandatory for all adults, we're never going back there. For too long, we've accepted what the Mitt Romneys and Rabbi Rosenblatts of the world have told us: that we are a threat to their family values and their belief systems. But the truth is, they are quickly becoming a threat to ours. Nicole Rodgers is the Co-Founder and Editor-in-Chief of Role/Reboot, where this post originally appeared. Republished with permission.